Carole Coeur, an MSF field coordinator in western Ivory Coast, describes what MSF staff in the area have been seeing at a time of increasing violence and insecurity. 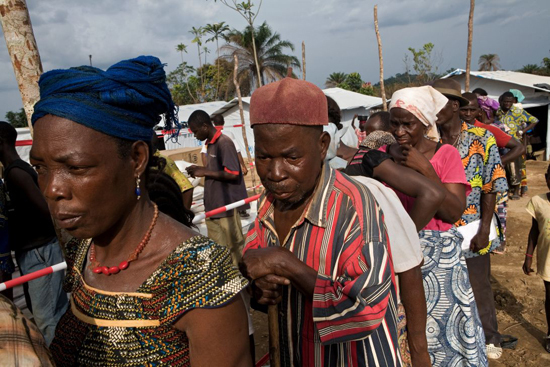 Ivorians waiting for a food distribution at the Bahn Refugee Camp in Liberia. Okay, what is happening in the last week is the fighting is increasing everywhere in the country, especially in Abidjan and the west. The frontline is going more and more to the south. Each time the frontline moves, the population is moving away or to the Liberian border, or they displace themselves inside the country. Depending on their ethnic origin, they will go to the south or to the north. Earlier this week, renewed fighting around the town of Duékoué sent more than 60 wounded people to the MSF-supported hospital in Bangolo, about 30 kilometers (18 miles) north. The MSF local staff in Duékoué also received 138 patients. At least hundreds of people fled the town, and among them part of the medical staff. Their situation is very worrying—the population continues to suffer from the direct consequences of the violence. How is the mood among the displaced people the staff is seeing? The feedback we got through the mobile clinic is that the people are really, really scared. Because the actual crisis reminds them of what happened in the past [i.e. the civil war that plagued the country from 2003 through 2007] and they are still very traumatized by that. Some are in the camps. Some are in [the homes of] host families. Some are hiding in the bush. Some are still in Ivory Coast. Some others are on the other side of the border. They are really following the rumors. And as soon as they hear that maybe [there’s] been some gunshots in this area, they are so afraid that, again, they run away and they hide until they are sure that they are able to come back. How do the population movements effect the provision of health care? Like the population, the medical staff is running away also, so it means that most of the health structures are completely empty. And the ones that still have some staff, some are still working, some others are less motivated, let's say, because they do not receive their salary at the moment. The other issue is lack of medicines and also the difficulty for the drug supply. As the population is quite afraid and traumatized by what is going on, it is quite difficult for them to move and to access the health structures, especially when they are not sure to find medical staff or drugs. Also, some structures have been looted and now they are completely empty. There are no more drugs, no more mattresses, nothing inside. There are issues with pregnant women who need to deliver, you’ve said. What other health issues are you seeing? There's a lot of malaria and quite a lot of diarrhea, for sure linked with difficult access to water. The water is not running well at the moment, but it's amplified by the fact that two weeks ago the electricity was stopped for five days. And [for another] three days here again we've got this electricity break. The distribution of water is done by the electricity, and when there is no electricity there is no water. So it means that the population needs to find some other way to get water. And it's not clean water. What are the conditions inside the camps in Ivory Coast? The first camp where people went was pretty crowded and not really well organized. But [the process] has been taken charge of by a few organizations and agencies. So the last two camps opened in Danané are quite well organized. They've got water supply. They've got latrines, and some food distribution, and the only thing missing was the health. That's why we will go there also. What have you seen when conducting mobile clinics? I know that the first mobile clinic we did five consultations and 11 antenatal care consultations. And at the last mobile clinic, we did more than 100 consultations and about 20 antenatal care consultations. That means that more and more people are aware that we are in the area and that they are coming. And also it means that they are coming back to their own villages. At the beginning we gave emergency kits to three hospitals in the area containing materials to treat large numbers of wounded people. We left them in the three biggest hospitals in the area – Man, Danané and Bangolo, and we resupply them as needed. And you’re working in conjunction with those three hospitals? Yes, with those three hospitals. One of them in Bangolo, where we are doing the mobile clinic. And for Danané and Man hospitals, we implement the emergency kits but also we are in close contact with them because we are doing the referrals to them. Are MSF national staff members being affected as well? Yes, like the rest of the population. Two days ago, one of our drivers was explaining me that he's got his two daughters in Abidjan and he was really struggling to find a solution for them, to help them, to leave Abidjan and to come back to their original village. And it's dangerous, it costs a lot of money. So it's as difficult for them as for the population.